Mountain biking is a sport on the rise and as such new trails are being blazed constantly, opening up the world of mountain biking to more and more people, worldwide. Every mountain biker can you his or her opinion of the most awesome mountain biking trails in the world, and in reality, they’re all right. Depending on your skill set, the time of year you visit, and the condition of the trail on any given day, each mountain biker will have his or her own personal experience on the trail. And that’s really the beauty of mountain biking. You never know what you’re going to get. From California to the Alps, Nepal to New Zealand, the world is being explored in new and exciting ways, atop a mountain bike. The French Alps are definitely at the top of any list of the most awesome mountain biking trails in the world. With a system of chairlifts throughout the area, there’s hardly any uphill biking, just kilometer after kilometer of extensive, and exhilarating downhill trails. The French Alps are a major destination for any mountain biker from anywhere in the world. Also high up on the list of ultimate mountain biking trails is Whistler, Canada. With over 120 miles of trails to explore the mountains of British Columbia Whistler also has many chairlifts that help skiers and snowboarding access runs during the winter months, but also can be used by mountain bikers in the warmer, less snowy months of the year. If you’re looking for mountain biking trails, you’re going to want to look for the mountains. What better place to find truly epic trails than in the Himalayas. Nepal is home to the world’s tallest mountains, and logically speaking some of the sickest downhill trails ever. Accommodations while exploring these trails include camping for the truly brave willing to face extreme weather conditions, or staying in tea houses run by locals of the area. Mountain biking in Nepal is truly reaching the pinnacle of the most awesome trails in the world. Take a plunge in the opposite direction of the Himalayas and explore the trails through Death Valley in California. Death Valley in the Mojave Desert is one of the hottest places in the world, with temperature reaching up to 134 °F (56.7 °C). With the lowest point of elevation in North America, Death Valley plummets to 86m (282ft) below sea level. This is not for the faint of heart, but it is home to some of the most dramatic landscapes in the world. For some more incredibly hot trails, visit Turpan, in the Gobi Desert, China. This is literally the hottest spot in China with temperatures exceeding 100 °F most days of the year. While this place is hot, its hills seem like they were created solely with the purpose of mountain bikers in mind. Once you’re tired of extreme heat in some of the world’s driest deserts, head down to New Zealand to explore the awesome trails in Rotorua, just a four hour drive from the Auckland. 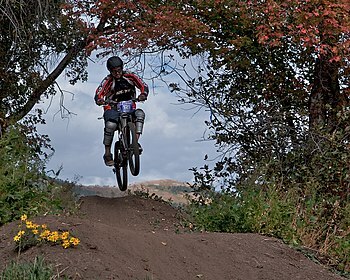 Rotorua boasts over 100 kilometers of riding trails, and hosted the 2006 World Championship of Mountain Biking. This is one place you don’t want to miss. These are just some of the most awesome and extreme mountain bike trails to be found throughout the world, but there are plenty of others closer to and further from your home. What are you waiting for? Get out there and explore some trails. Start creating your very own list of the most awesome mountain biking trails around the world. Ali Asjad is a content strategist based in Stockholm, Sweden. He helps companies like Mountain Bike Costa be more successful and visible online. Circle him on Google+ to further the conversation. This entry was posted in Travel Tips and tagged British Columbia Whistler, Death Valley, French Alps, Gobi Desert, Himalayas, Mojave Desert, Mountain bike, Mountain biking. Bookmark the permalink.